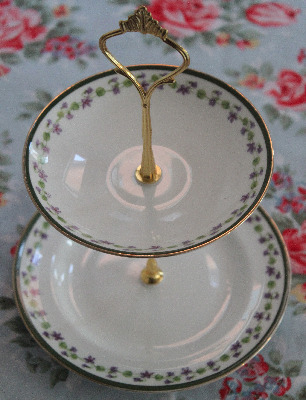 A very pretty mini cake stand made from a vintage bone china saucer and side plate. The plates are in excellent condition with no chips or cracks. The cake stand is fully collapsibly and simply unscrews for easy storage. This makes a lovely stand for chocolates or nibbles and gorgeous when used as a jewellery stand!